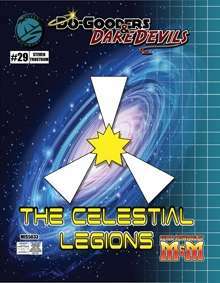 This release of Do-Gooders & Daredevils brings you The Celestial Legions, a group of intergalactic heroes and peacekeepers who gain their power by bonding with an alien life force. The legions seek to bring justice to the universe in order to redeem a great betrayal their bound alien essences' species once committed. Within this PDF you will find rules on creating members of the alien species that have not seen fit to join the Legions' cause, all you will need to create a Celestial Legionnaire character of your own, including a baseline alien life force and a Celestial Legionnaire template, and an example Legionnaire, Droog, who can be employed to help Gamemasters introduce their players to their game's wider universe. Note that the new advantage included will also appear in Better Mousetrap 3e.